The Ontario Society of Adlerian Psychology (ONSAP) is interested in encouraging and promoting the principles of Adlerian principles in daily living. We aim to lead by example with community harmony through initiatives that facilitate effective parenting, counselling, teaching and community development based on the principles of mutual respect, cooperation, encouragement and social interest. 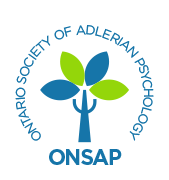 We are an affiliate of the North American Society of Adlerian Psychology (NASAP). The Ontario Society of Adlerian Psychology is an organization dedicated to furthering the understanding and application of Adlerian Psychology (also called Individual Psychology) based on the work of Alfred Adler. The purpose of the Ontario Society of Adlerian Psychology shall be to educate the public and mental health professionals by offering conferences, workshops and teleconferences about Adlerian Psychology and its various implications and uses in everyday life. The next Newsletter will be published May 2019. The theme is Self-Care. The deadline for submissions is May 7, 2019.